In 2012, 231 women in Israel were diagnosed with invasive cervical cancer and 883 women with cervical cancer in situ (early stage of the disease, which may be detected by a pap smear). The incidence rate (morbidity) for cervical cancer in situ (early stage) in 2012 was 2.3-fold higher in Jewish women and 7-fold higher in Arab women compared to rates observed in 1990, meaning there has been improved early detection of the disease. 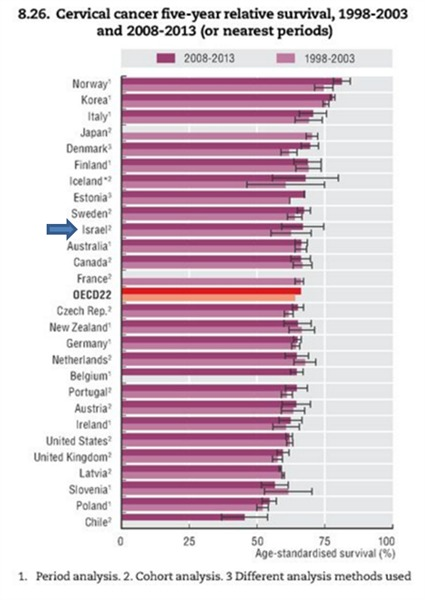 However, the pap smear screening rate in Israel* (preventive screening test for the disease) is low compared to the OECD rate (45% and 60% respectively). (*According to the National Health Survey INHIS-2 implemented by the Israel Center for Disease Control of the Ministry of Health from 2007-10, among women aged 21 and over, and the OECD report for 2013, which refers to ages 20-69). In 2012, 76 women succumbed to cervical cancer in Israel. The cervical cancer morbidity and mortality rates are low in Israel compared to those of Western countries, and the trends indicate stability both among Jewish women and Arab women alike. Cervical cancer is the third most common cancer in women in the world, after breast and colorectal cancer. In Israel, cervical cancer is not prevalent and morbidity rates are among the lowest in the Western world. In 2012, 231 Israeli women were diagnosed with invasive cervical cancer: 188 Jewish women, 19 Arab women, and 29 'other' women* (who are not Arab). Morbidity rates in Jewish women exceed those of Arab women. The average age at diagnosis of invasive cervical cancer in Jewish women was 55, and in Arab women, 50. The highest morbidity rates of invasive cervical cancer, in Jewish and Arab women were observed in the 55-59 age-group. The morbidity rate of invasive cervical cancer in Israel is among the lowest among OECD countries according to WHO statistics (Globocan 2012). *Others refer to non-Arab Christian women, and those who are not affiliated with any particular religion. In 2012, 883 women in Israel were diagnosed with cervical adenocarcinoma in situ: 745 Jewish women, 31 Arab women, 107 'other' women. There is a continual rise in cervical cancer in situ morbidity rates among Jewish and Arab women, indicating an increase in the number of those undergoing pap screenings for early detection. The main diagnosis of cervical cancer in situ is carried out between the ages of 25 and 39. The highest rate of pap screenings was reported in the 45-54 age-group. There has been an increase in the five-year relative survival rate for cervical cancer among Jewish women over the years and it currently stands at 71%. Among Arab women, due to the small number of patients, the differences in years are not substantial and the survival rate is estimated at 70%. The average five-year survival rate for cervical cancer in Israel exceeds the OECD average and Israel ranks among the leading ten countries in survival. In 2012, 76 women succumbed to cervical cancer: 61 Jewish women, 6 Arab women and 9 'other' women. The average age at demise from cervical cancer was 62 among Jewish women and 50 among Arab women. The trend in invasive cervical cancer mortality indicates a moderate increase up to the mid-90s and since then stabilization of mortality rates. Click here for detailed statistics in the full report (in Hebrew). Primary and Secondary Prevention of Cervical Cancer – what is recommended and what is included in the Healthcare Package? The WHO regards vaccines as the most important primary prevention method and recommends vaccinating young girls between the ages of 9 and 13 against the HPV virus before they become sexually active. What is included in the healthcare package? In January 2013 the HPV – Human Papilloma Virus - vaccine was included in the healthcare package for 8th grade girls. Please click here to view the Ministry of Health Director General Circular (in Hebrew). Starting from the 2015-2016 school year, a vaccine was also given to 8th grade boys. For the remaining women, to date, vaccines are given through supplementary insurance plans provided by the healthcare funds and for a deductible to be paid by the insured. Any girl or woman should consult with a family physician or gynecologist when considering receiving a vaccine, and should also request clarification as to the pros and cons. As the vaccine doesn't protect the body from all genotypes of the papilloma virus, which are liable to cause cervical cancer, one should not suffice with a vaccine against HPV, but rather, should also undergo a pap smear to detect cervical cancer at an early stage. A routine pap smear to screen cervical cancer once every three years is the best way to detect any changes in the cervical tissue. Early detection and timely treatment will prevent the development of a malignant tumor in this region of the body. According to the up-to-date guidelines of the Ministry of Health Director General Circular on Prevention and Detection of Malignant Diseases, dated June 2012, women aged 25-65 are advised to undergo a routine preventative screening- pap smear- once every three years. A woman defined by a physician as belonging to a high risk group, should consult with the said physician regarding the age at which testing should begin and screening frequency. Cervical cancer screening is included in the healthcare package for women aged 35-54, once every three years. The ICA 'Prevention and Early Detection of Cervical Cancer' booklet has been updated and is available to the public free of charge. To order a copy of the booklet, please contact the ICA Telemeida teleinformation service at: 1-800-599-995. Please click here to read the Prevention and Early Detection of Cervical Cancer booklet on the ICA website (in Hebrew). Does the loss of someone close increase the risk of HPV and cervical cancer? It is known that the loss of someone close may lead to the development of an array of physiological and emotional diseases. Investigators from various medical centers and universities in Sweden sought to explore the link between loss and bereavement, on the one hand, and the risk of contracting the Human Papilloma Virus (HPV) and cervical cancer morbidity, on the other hand. The exposure to HPV is extensive and normally not dangerous; however a small number of HPV genotypes increase the risk of contracting cervical cancer. The research study was based for the most part on cervical cancer statistics of the Swedish Cancer Register, spanning the years 1969-20111, which included statistics on an estimated 14 million pap smears (cervical cancer screening), taken from an estimated 2.5 million women. 'Abnormal' cell finding – 390,301 pap tests revealed 'improperly functioning' or 'abnormal' cells which are likely to develop into cancerous cells; five pap tests with normal results, of women who share similar characteristics such as age, lifestyle, screening compliance, and other personal attributes, were compared with each screening with an irregular pap smear status. These screenings served as a control group. Cervical adenocarcinoma in situ or invasive cervical cancer – 69,674 tests of women who contracted cervical adenocarcinoma in situ were identified, as were 5,454 tests of women who contracted invasive cervical cancer. Five tests with a normal status from screenings of women with similar characteristics such as age, lifestyle and screening compliance, and other personal attributes, were compared to each one of the tests with abnormal results. These screenings served as a control group. Contracting the HPV16 Human Papilloma Virus – out of an additional collection of pap smear samples, which encompassed 4,033 screenings, 203 were detected with HPV16, which is one of the frequent strains, with a high risk of triggering a malignant process in the cervix, whereas the results of 3,830 screenings did not show this virus and were used as a control group. Loss increases a woman's risk of an irregular finding on a pap test by 4%-9%, as well as her risk of contracting cervical cancer in situ or invasive cervical cancer, while this risk is particularly high among women who have experienced several losses, the loss of a child, spouse or sibling. No link was found between the time interval which passed since the loss, and the interval during which the cervical cancer developed. The investigators explain that this is not surprising, since the mourning processes, akin to the development of cervical cancer, are not immediate events, but rather, continue over time, sometimes, for years. The loss of a parent increases the risk of cervical cancer, only among women aged 40 and under. Women who experienced some kind of loss had a 62% higher risk of contracting the HPV16 genotype. The association was stronger among women with a history of contacting HPV16. The investigators conclude that bereavement may have an impact on the various stages of the development of cervical cancer. This is mainly due to the fact that the emotional stress involved in loss may increase the risk of contracting HPV among women who did not contract HPV in the past, as well as accelerate the progression of the disease from a pre-cancerous state to in situ, and from cervical cancer in situ to invasive cervical cancer. Is there a link between cervical cancer and exposure to a spouse's smoking? Rising cervical cancer mortality in young Chinese women has been observed; cervical cancer is one of the most common types of cancer in China and developing countries. According to the annual report of China's National Cancer Registry, each year, over 100,000 women are diagnosed with the disease, constituting approximately a third of global cervical cancer cases. One of the factors known and proven to increase the risk of contracting cervical cancer is active smoking (of the woman herself), however, there is no evidence regarding the association between passive smoking, due to exposure to a spouse's smoking, and the risk of contracting the disease. In a first-ever research study, investigators in China, sought to explore the link between active smoking, passive smoking, and their combination on the one hand, and the risk of cervical cancer mortality on the other hand. The investigators compared the exposure to smoking of 1,865 Chinese urban women, aged 35 and up, who succumbed to cervical cancer, with that of women who succumbed to cervical cancer for reasons not related to smoking. The data was taken in part from an international survey conducted in China spanning the years 1989-1991, and in part from interviews that the investigators conducted with spouses of women who had died. Based on the findings, it emerges that generally speaking, women who are exposed to smoking have a 51% higher risk of cervical cancer mortality than women who are not exposed to smoking, while the exposure to passive smoking increases the risk by 28%, the exposure to active smoking increase the risk by 49% and the exposure to both active and passive smoking increases the risk of cervical cancer mortality by 69%. Women who were exposed to passive and active smoking of a moderate level, had a 67% higher risk of cervical cancer mortality. An 88% increase in the risk of cervical cancer mortality was observed among women who were exposed to heavy smoking compared to women who were not exposed to smoking. Active and passive exposure over a span of 15 years or less spurred a 73% increase in risk. And exposure over a span of 15 years or more, spurred a 95% increase in cervical cancer mortality risk, as opposed to women who were not exposed to smoking. Due to the research findings, the investigators call for the investment of efforts and resources in the prevention of smoking among men and women, to reduce the numerous hazards, one of which is cervical cancer among women. The Human Papilloma Virus (HPV) is very common and may produce lesions of the cervix, some of which may develop into cancer. Most of the lesions of the cervix have a low risk of developing into cervical cancer, and are transient, however, other lesions, with a high risk of becoming cancer – the CIN2 and CIN3 strains - for the most part are not transient, and increase the woman's risk of developing cervical cancer. In a study conducted in the United States, the investigators sought to estimate the risk of contracting a pre-cancerous lesion – of the CIN2, CIN3 strain – or contracting cervical cancer, among women who had contracted inflammatory diseases such as inflammatory bowel disease, psoriasis, arthritis and lupus. One of the hypotheses was that their weakened cellular response, mainly if they take medications that suppress the immune system due to their disease, may spur repeated contracting of HPV, and in turn, may increase the risk of the emergence of pre-cancerous lesions of the cervix and cervical cancer. The research study was based on a database consisting of an estimated 650,000 women, spanning the years 2001-2012, of whom an estimated 133,000 are patients suffering from one of the aforementioned diseases, and the remaining women served as a control group. The investigators revealed that women who have arthritis and lupus have a 50% higher risk of contracting a pre-cancerous finding with a risk of developing into cervical cancer, as well as a higher risk of developing cervical cancer, compared to women who do not have inflammatory diseases. Since cancer patients are usually treated with medications that partially suppress the immune system, as well with as steroids, the investigators don't know if the increase in risk is caused as a result of the suppression of the immune system caused by the medications, or caused by the disease itself, or by a combination of the both factors. They suggest continued study to investigate this important point. Similarly, the investigators recommend taking action to ensure early diagnosis, thereby preventing cancer from developing, or improving the chances of a cure, if indeed the patient has been diagnosed with cervical cancer.